Amenities: Air Conditioning, 2 GPS (1 with plotter), full refrigerator, Phaser 8.5 KW generator, microwave, color TV, stereo, CD (you can bring your own CD's if you want), spacious bridge, large cockpit, large comfortable salon with plenty of seating, stove, double sink, vacuum flushing toilet. The boat is comfortable and is an excellent performer in big seas. Fishing Gear: Full sets of Penn International and Shimano 130's. They also carry a mix of Shimano And Penn 80's to 20's. Flyfishing gear and ultralight tackle is also available. Multiple stick gaffs, flying gaffs, nets, lures and bait are also carried. Charter in comfort, fish with experience. Richard Silva put his winning in the Lahaina Jackpot Fishing Tournament towards the purchase of the Wild Bunch which he bought in California in the early 90’s with the intention of using the boat for both charter and private use. He likes to fish some of the tournaments with friends and family, and he still loves taking the boat to the neighbor islands for the annual canoe races, overnight charters, and relaxation. 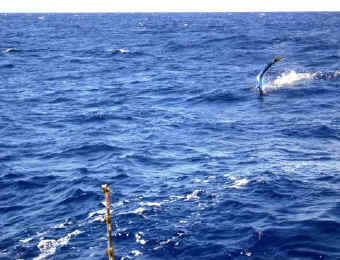 Richards largest marlin to date is a 1477lb caught in 1987, one of the largest marlin every caught. Had they been able to weigh the fish sooner (they had to slowly tow it in), the fish probably would have weighed in even heavier. Don’t let the name fool you. While "The Wild Bunch" might seem a more appropriate name for a party boat than one designed, engineered, equipped and staffed for catching fish, their record speaks for itself. Wild Bunch is also family friendly. Read about 10 year old Jake's first Mahi on the Wild Bunch. Capt. Mike Strait moved to Hawaii from Kansas in 1987. 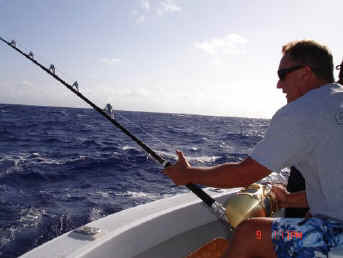 Mike started charter fishing in Hawaii in 1988. In 1991 he obtained his Captain’s License and headed North to Alaska. Mike has fished throughout the all of the Hawaiian Islands and Atolls all the way up to Midway. Mike specializes in flyfishing (8-14 weight equipment) and light tackle charters for Mahimahi, Ono and Ahi, but also enjoys heavy tackle sportfishing for the big ones. Capt. 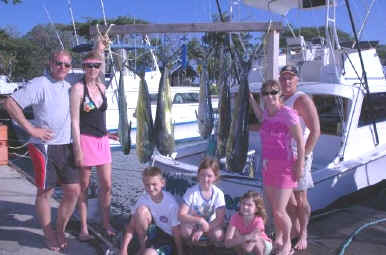 Mike enjoys teaching those who want to learn more about fishing in Hawaii and is excellent with families and kids. Capt. Mike will go for smaller tuna's at the buoys for more kid friendly action or he will look for the big marlin, the trip is up to you. Your comfort is Capt. 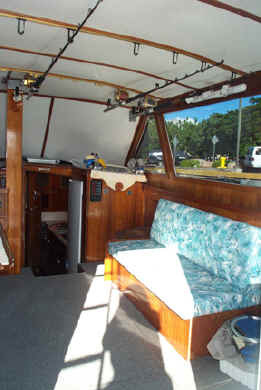 Mike's priority and he will do the best possible to keep the boat in comfortable waters if seas are a concern for you. With over 30 years of overall fishing experience, Capt. Mike is an excellent choice for a day on the water. Captain Karl Adams started sportfishing in Hawaii in 1969, in 1985 he got his license and has been chartering in Alaska, Midway, and throughout the islands ever since. Karl’s family moved to Hawaii from California when he was 10. Karl’s father passed away at an early age. Karl learneda valuable lesson from this, and decided to pursue a less stressful lifestyle. Karl’s background in glasswork, carpentry, and mechanics, is applied on a regular basis in maintaining the Wild Bunch vessels to their optimum performance level. 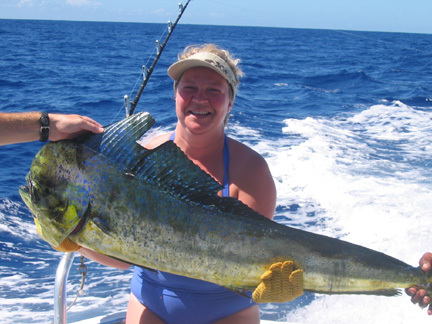 Karl’s philosophy on charter fishing is to provide the guests a fun day of fishing and catching. He works hard to find the fish, looking for birds and other signs of bait in the water which indicate fish in the area. He's not afraid to change lures if something is not working and he loves to bait for extra Mahi's when he finds a nice school of them. Capt. Karl is good with kids and very enjoyable to "talk story" with up on the bridge. Capt. Karl is semi-retired and occasionally joins a trip. A fair fish disposition policy. Hawaii’s cost of doing business is among the highest in the United States, yet the average cost for a charter trip is among the lowest in the world for boats of this caliber. Thus, the sale of fish is how they have made it possible to survive. Also, by having the opportunity to sell their fish, there is an inherent motivation for them to find the schools and enhance the catch for the charter guest. Generally speaking, the Wild Bunch will take any single fish over 100 pounds to the market for sale, while anything under this weight can be distributed in an equitable fashion among those guests who would like to keep some fish. If you would like to BBQ your catch, please ask the skipper or crew and they will be happy to make arrangements. Of course, conservation is very important, and any customer wishing to tag and release billfish are welcome to do so. So if you are looking for a fishing charter on a clean, comfortable boat complete with air-conditioning and all the toys, and you are looking to fish with a skipper that will show you a good time, consider the Wild Bunch. Sportfish Hawaii is proud to represent Team Wild Bunch in our fleet of high-class charter boats. Sportfish Hawaii and the Wild Bunch work with the Make a Wish Foundation to arrange fishing trips for Wish Children visiting Hawaii. The photos below are of Matthew who wanted to catch a fish in Hawaii. The left photo is Matthew fighting the Mahi with the support of his Dad, Dan. 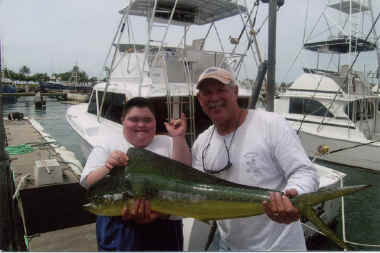 The right photo is Captain Carl of the Wild Bunch with Matthew and his nice Mahimahi! "We would like to thank you for the absolutely wonderful Make-A-Wish trip that my son Matthew received this March on the Wild Bunch. We had a fantastic time. Captain Carl and his deckhand Clint made the trip very enjoyable, and they worked hard to make sure that Matthew caught a fish. We are looking forward to returning to Honolulu and spending more time on the Wild Bunch." Make a Wish is a wonderful organization and Sportfish Hawaii is honored to be able to help get Wish Children "Hooked up" in Hawaii. We are thankful for the Wild Bunch supporting this effort.